Hello, and welcome back to our blog here at Cedar Mountain Tree and Lawn Care. 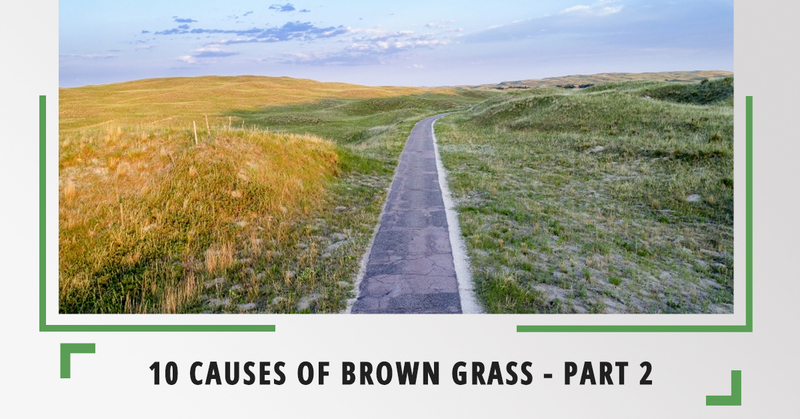 This is part two of our blog series about the main causes of brown grass. Whether you’re struggling with a patch of stubborn grass that can’t keep up with the rest of your lawn, or your whole lawn is turning brown, keeping reading to learn some of the possible causes. Believe it or not, the condition of your lawn mower could be having a huge impact on the health of your lawn. Dull lawn mower blades or a weak motor could be causing your grass to get yanked out instead of cutting it cleanly. It’s easy to tell if this has been happening. First, check your grass. If the tip of the grass is jagged instead of straight, you can be pretty confident that your mower is in no shape to cut it. Another potential cause of brown grass is that the mower blade is set too low. Setting your mowing height to at least three inches will help your grass protect the roots and prevent moisture from being evaporated from the soil. Just like with the flowers in your flower pots, grass needs healthy soil in order to survive. Soil can get ruined in a variety of ways, but it will almost cause your grass to turn brown and most likely die. If you notice a lot of dirt patches in your lawn and can’t aerate it easily, you may need to amend your soil so your grass will look green and lush once again. As much as we love our furry little friends, they can wreak havoc on our lawns. Dogs, birds, and other animals can create urine spots that can cause your lawn to turn yellow or die in some areas. If you have pets, it may be a good idea to keep a better eye on them while they’re out in the yard. Are you aware of all the chemicals that you keep on or on your lawn? Chemicals like gasoline, fertilizer, pesticides, and herbicides can cause dead spots if they’re left on or spilled on the lawn. If you have a shed where you keep your chemicals, check to make sure there isn’t a leak, and make sure to only use them on your driveway to kill weeds, not on your grass. Thatch is a buildup of dead grass that blocks sunlight and moisture. When grass dies, sometimes it gets lumped together with other grass and sticks to the top of the soil. You can use a special dethatcher tool to remove the thatch and allow your grass to breathe again. Cedar Mountain is your Top Rated Local® Tree and Lawn Applications company in South Central Wyoming. We’re accredited, bonded, insured and state-licensed so that you’ll never have to worry whether you’re getting the services you’re paying for. Contact us today to learn more about our services.